This challenge is this pretty dress from Marchesa Notte! Love the ink blue background with pop of pretty pink and the bold pink shoes. I am taking the colours from this outfit as my inspiration for my card. I have used Altenew’s Golden Garden stamp set to stamp and make my background. I used Doll Pink and Blue Violet inks from Simon Says Stamp. I LOVE the two colours together. Bright and beautiful with a lot of white. Then I layered a piece of vellum. 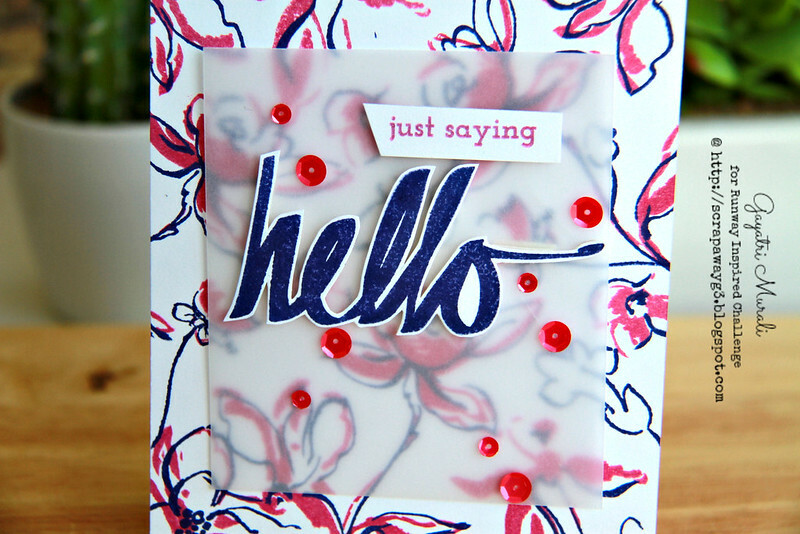 The sentiment is from Super Script stamp set also from Altenew. I stamped the large sentiment and hand cut it out. The smaller sentiment is stamped on a strip of white cardstock. I popped them both using foam adhesives. Finally embellishing with Pretty Pink Posh’s Pink Peonies sequins. Here is a closeup! Hope you like my take on the challenge. Check out Runway Inspired Challenge Blog for more inspirations from design team. Come and play along the challenge! Such a gorgeous card! So beautiful!